As a leader in combating spam, EzSpamCure is committed to providing a highly effective solution to help you significantly reduce junk email. This documentation will guide you through the basic EzSpamCure setup process quickly and easily. For more information on advanced settings and customization options, please contact your EzSpamCure account representative at support@jenica.com. You should have received a welcome email with your username and password, if you have not received this information or have misplaced it contact customerservice@jenica.com. You can manually add or remove user accounts in the Junk Mail Control Center. See below for a step-by-step description. You can use the Automated Account Setup tool in the Junk Mail Control Center. This method is ‘hands free' but it does not create any email aliases within EzSpamCure, so it is not recommended for most customers. EzSpamCure can periodically connect to your mail server to automatically mirror the email addresses and aliases already established on your mail server. This is typically done via LDAP integration, and can be handled by several methods. EzSpamCure can provide you with a web services interface by which you can programmatically control email accounts and preferences within EzSpamCure. Log into the Junk Mail Control Center at http://admin.ezspamcure.com with the username and password provided in your welcome email. Click on ‘Add New Users' in the middle of the Welcome page. Enter one email account and password (if desired) per line. If you do not provide a password, that user will be assigned a default password of ‘password' (minus the quotation marks). Click the ‘Save Changes' button at the bottom of the window. An alias is a secondary email address, such as info@yourcompany.com, that is forwarded to another email address. All aliases should be entered into EzSpamCure so that they too can be filtered for spam. An alias will inherit the spam handling rules and whitelist of its linked account. Select ‘Manage Existing Users' from the menu on the left. Type the alias(es) into the window and click the ‘Save Changes' button. Select ‘Manage Existing Users' again from the left-hand menu and you should see the alias listed in italics, as in the below example. Now that your users are entered into the system, you can select from one of several spam handling options. You can change the domain-wide setting by clicking on the ‘Set Default Spam Handling' link on the left-hand menu. Redirect junk mail to individual, password-protected junk mail quarantines for each user. The quarantine is hosted by EzSpamCure and can be reviewed at any time by end users. The use of the quarantine reduces the bandwidth requirements for an organization's network as well as the load on its mail server(s). This is the recommended spam-handling option. The first option is for EzSpamCure to simply drop the message. Be advised that, with this option enabled, any message detected as spam will be gone for good. As a result, we do not recommend selecting this option at first. The second option is for EzSpamCure to modify the subject line of messages that are detected as spam, and forward them to the end-user. 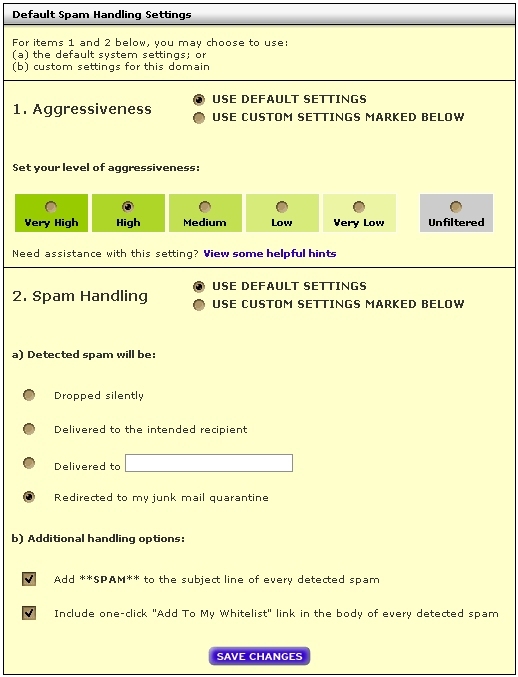 EzSpamCure will add the phrase "**SPAM**" to the beginning of the subject line for detected spam messages. The third option is for EzSpamCure to redirect all the junk mail to a single e-mail address at your domain, i.e. spam@yourcompany.com. This allows for administrator-level review. To begin filtering, all that is necessary is a change in the "MX" records for your domain. The MX records are part of your DNS information and are responsible for directing incoming email. By making this change, you are enabling the EzSpamCure systems to filter your inbound email for spam and viruses before those messages are routed to your mail server. Typically, your DNS records are maintained by your ISP or hosting provider, and they should be able to make this change for you. Some customers have access to a web-based control panel by which the change can be made. yourcompany.com. IN MX 10 yourcompany.com.pri-mx.smtproutes.com. yourcompany.com. IN MX 90 yourcompany.com.bak-mx.smtproutes.com. Details for your specific domain MX records were provided in your welcome email, if you didn't receive them or misplaced them, please email customerservice@jenica.com. Please note that unless instructed otherwise, you should not update any "A" records in your DNS - the only changes that should be made are the replacement of your previous "MX" entries with the new ones for EzSpamCure. After this change has been made, your email will be automatically filtered through EzSpamCure before being delivered to your mail server. The filtering usually starts within a few minutes of the DNS change, though in some cases it can take up to a day or two for the change to take full effect. If you decided to have detected spam emails redirected to the junk mail quarantine, then we recommend that you turn on Message Digests in 'Email Notifications'. 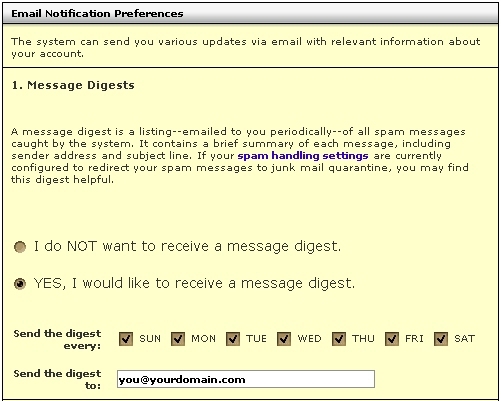 A Digest email will be sent to you as often as you choose, daily, weekly, bi-weekly on whichever days you like. Once you've turned Message Digests on you'll receive an email listing detected spam emails. Next to each email From address will be a link to 'Release' the email to your inbox if it was mistakenly detected as spam. After releasing the email you are also given the option of 'Adding to the Whitelist' the email address so it will always be directed to your inbox and never filtered as long as it is on the 'Whitelist'. If you have any questions or would like any assistance with changing your MX entries, please don't hesitate to contact your EzSpamCure account representative at support@jenica.com.